For superior mask comfort, we recommend the AirFit N20 Nasal Mask. Aclaim®2 nasal mask has been designed to fit better, all night, every night. It's a giant leap forward in mask design and comfort, to improve the effectiveness of CPAP treatment for all OSA patients. 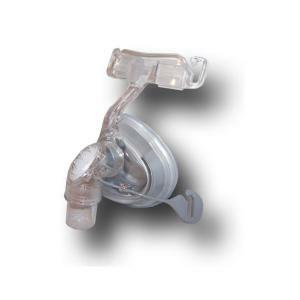 The Aclaim®2 CPAP mask is easier to wear and use. It offers greater comfort, less noise and adjustment-free fit and removal. The new FlexiFit™ cushion technology offers a unique combination of silicone seal and foam cushion makes the mask more comfortable, while providing an effective seal around the nose and facial contours. The unique glider mechanism allows more freedom of movement and stops the mask being pulled askew during the night. It's also designed for easy one-step fit and removal. The FlexiFit™ cushion automatically conforms to different bridge depths and facial contours meaning the forehead rest doesn't have to be mechanically adjusted, making it easier to fit. Comes complete with two sizes of silicone seal, to ensure an effective fit.